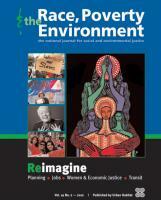 About Race, Poverty and the Environment | Reimagine! 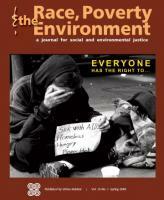 RP&E is the national journal of environmental and social justice. Since 1990, it has served as an essential tool for building the movements for justice through reporting, analysis and research. Annual subscriptions are available for $45 for individuals and $90 for institutions. 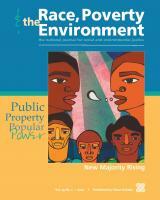 Archival issues of RP&E Journal dating back to 1990 are available and may be obtained online, in print or on CD. 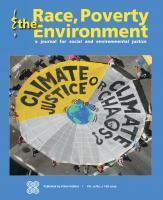 • Covers a broad spectrum of topics including environmental and climate justice, migrant rights, gender analysis, and the many dimensions of economic justice. • Publishes special sections on subjects such as women organizing in education and health, domestic work, social reproduction and feminist solidarity. • Serves 60,000 unique visitors monthly at its website (www.reimaginerpe.org) where a world-wide audience reads hundreds of articles reporting on and analyzing social justice movements, downloading over 1.5 million pages per year. • Provides thousands of universities around the world access to 25 years of url-stable archives of RP&E articles through the premier online archive of academic journals, JSTOR (www.jstor.org/journal/racepoveenvi). • Organizes open editorial meetings, panel discussions, workshops, trainings and performance events that lift up issues impacting disenfranchised communities enabling participants to effectively use their experience to create strategies and solutions that empower and transform. • Amplifies the voices of organizations and individuals from a broad spectrum of issue- and constituency-based movements via articles, podcasts and co-publishing arrangements with progressive news outlets through the independent publishing network The Media Consortium. • Offers full-service consulting to organizations seeking to write, edit, design, publish and distribute text and multi-media content. 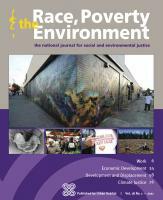 The same team of professionals who work together to produce RP&E have created books, annual reports, websites and graphic designs for organizations such as Movement Generation (MG), Mujeres Unidas y Activas (MUA), Center for Story Based Strategy (CSS), The Kresge Foundation, Feminist Alliance for Rights, Roadmap Consulting and others. 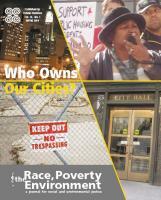 • Is a fiscally-sponsored project of the Movement Strategy Center with 501(c)3 nonprofit tax-exempt status. 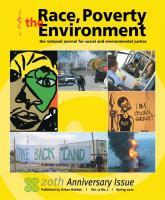 The idea for the Race, Poverty and the Environment newsletter grew out of a caucus of interested people at the University of Oregon’s Public Interest Law Conference, held in March 1990. Caucus participants recognized the importance of increased attention to the nexus of race, class and environmental issues and the need for a forum in which to continue their dialogue. 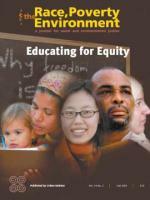 At the First National People of Color Summit, held in Washington, D.C., in 1991, Carl Anthony gave a presentation on sustainable growth and made a case for environmental justice organizations to broaden their scope beyond anti-toxics campaigns. 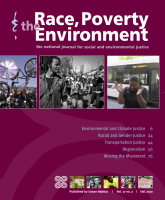 The summit was a pivotal event for the environmental justice movement, and delegates affirmed 17 principles to guide their work. RP&E was there to cover the emerging movement and to share the energy with its growing network. 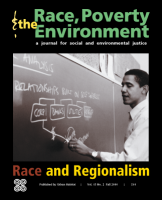 In the follow-up issue published in Fall 1991, Paul Mohai and Bunyan Bryant of the University of Michigan provided a historical and sociological examination of the subject of environmental racism. Dana Alston of the Panos Institute gave her view of the Summit and how it is altering the environmental movement. RP&E has continued this vital function as an information hub for more than 20 years, growing from a 16-page photocopy edition in 1990, to a professional print, Web, and radio service today.